With over 20 years as a performer, speaker, facilitator and educator, Simon is a refreshingly different choice for your next event. Simon’s does much more than give the audience another “keynote speaker experience”. He creates opportunities to get people actively engaged in every session he runs - creating an environment where people can play, laugh at themselves, reflect and challenge themselves to think differently. Here’s a snapshot of Simon’s most popular conference topics. Get in touch if you’d like to explore how Simon’s areas of expertise can best serve your event. How do we create the conditions for teams to truly perform at their best? The research is in. The number one differentiator between the highest performing teams and the rest is this: team dynamics. Without the right dynamics in place, otherwise smart and motivated individuals shrink in the presence of their team. In other words, the whole becomes less than the sum of its parts. What the…?! So what does it take to set a team up to play to their fullest? To enable people to be bold enough to do the things that truly underpin high performance: to speak up, challenge the status quo, to contribute ideas and to give and receive feedback. This presentation shows you how. How do we tap the true power of collaboration, in a way that adds productive value to your team and organisation? For many, the word collaboration evokes a jaded response, evoking memories of way too many meetings and post-it note sessions, being bombarded by colleagues expecting to be part of everything and an unhealthy obsession with building consensus on everything. In this presentation, Simon shows audiences the difference between productive and unproductive collaboration, offering them a clear way forward. Anyone in a leadership role knows that it comes with plenty of expectations, from all directions. We create principles & playbooks, frameworks & formats, all to help ourselves stay focused on the ‘right’ things. But what if - in trying to remember all the stuff we’re supposed to do - we miss the moments that really matter to our teams? The opportunities to really create connection and meaning? In this powerful presentation, Simon encourages leaders to put down the script, to get out of their heads and into the moment. How do you build engagement, commitment and action around important ideas and initiatives… even when you’re not in charge? 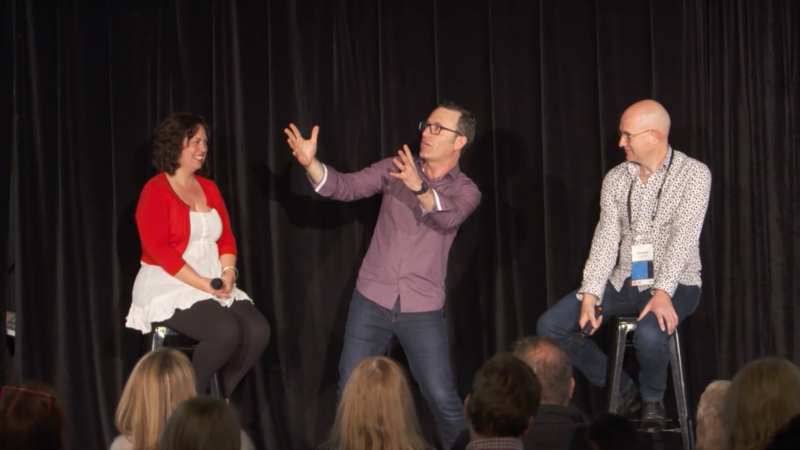 In this fun and highly practical presentation, Simon shows audiences the power of buy-in, and what it takes to master this gentle art. Based on Simon’s book, Work with Me: How to get people to buy into your ideas. Simon can also complement his keynote presentation with one of several workshops - a great opportunity to enrich the value he brings to your event. Trust Me… I’m a Leader! Looking for something different? Simon offers a unique experience called “The Improviser’s Way: lessons for teams from the wonderful world of improvisation” - which will leave you and your team more connected than ever, and with a set of principles that will inspire and underpin strong ensemble team work. And remember, most of Simon’s workshops can also be adapted for a main stage presentation.